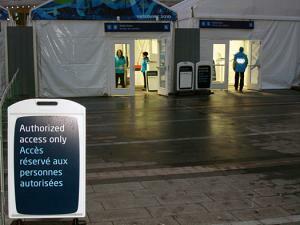 One of the most obvious differences between the Vancouver Games and the previous Olympics I've covered is just how painless it has been to pass through security at the various venues. Unlike past Games, gaining access to the main press center, or centre as they like to call it here, or the hockey rink is as simple as flashing my media badge. Then one of the 100 extremely bored but super nice security people will wrestle a colleague for the privilege of scanning the bar code on the front of may pass, and voila, my ugly mug pops up on a laptop screen in all its high resolution glory, and I'm free to enter. Of course, that can all change tomorrow when the Games begin. Somewhere behind the scenes former CIA agents could be working on plans to conduct full-body cavity searches and detailed background checks. Stranger things have happened. At the Games in Nagano, Salt Lake or Torino, passing through security was like making your way through Checkpoint Charlie in the 1950s. After standing in a line that rivals the worst airport security area, you would have to empty your pockets, turn on every electronic gizmo and gadget in your bag and answer a few questions like, 'what's your mother's maiden name,' before gathering your belongings. But before you could be on your way, all those wonderful Olympic pins that you pulled out of your pocket so they wouldn't trigger the metal detectors, would be picked over like candy from a pinata by uniformed policemen and security personnel alike. I don't know about you but I don't normally make it a habit of refusing requests from cops. I'd always make some joke like, 'hey, remember this when you see me being carted off by a paddy wagon later on,' as I hand each of them a pin. I was always a few pounds lighter every time I exited a security checkpoint. 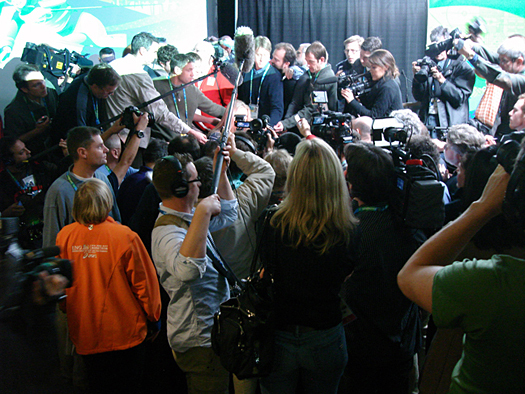 Lindsey Vonn was tough to get a clean look at through the wall of media personnel. This morning I was walking into the main press center, I mean centre, with Bruce Bennett, the Godfather of hockey photography, when the security guard stopped him to ask if there was anything in his camera case that he should know about. It was hard to fight the urge to shout out, 'don't forget to tell him about the five pounds of C4 in your case,' but I didn't want to run the risk of watching my best source for great hockey photos being carted off to jail. Seriously, I don't want to give anyone the wrong idea about Bruce. He's a great guy and a law-abiding citizen, I'm sure. His case was full of nothing but camera bodies, a few lenses, some lights and of course, some Olympic pins. Which he somehow managed to hold on to.